The bus carrying Nigeria's football team arrives at Makhulong Stadium ahead of Sunday's friendly international against North Korea. (CNN) -- A stampede of fans erupted outside a South African stadium Sunday before a warmup match between Nigeria and North Korea leading up to the World Cup, police and the local organizing committee said. There were no fatalities reported, police said, but 14 people sustained minor injuries. A police official was in stable condition after being trampled by the crowd, and a second police officer had minor injuries. 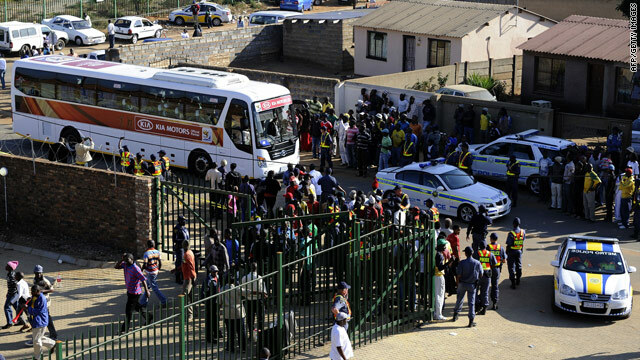 The match at Makhulong Stadium, in the Johannesburg suburb of Tembisa, was arranged by a private company, authorities said in a statement, and tickets were being handed out outside. "Initial reports from the stadium, which is not a 2010 FIFA World Cup stadium, indicate that 10,000 tickets were distributed outside the stadium, but a number of fans wanted to enter the stadium without tickets," the statement said. "It would seem that there was also some confusion among the crowd as to the ticketing system which led to disruptive behavior on the part of the crowd." Police began implementing "crowd management" measures, but the group pushed against the gates, twice forcing them open, authorities said. Calm was restored after police reinforcements arrived. In a statement issued after the stampede, the sport's international governing body FIFA said the match had "no relation whatsoever" to the upcoming World Cup contests. FIFA wished a speedy recovery to those hurt, but added, "Contrary to some media reports, FIFA had nothing to do with the ticketing of this game."